/9/28/Window-to-Your-World---A-Glazing-Tutorial/). But since I took the pictures anyway . . . 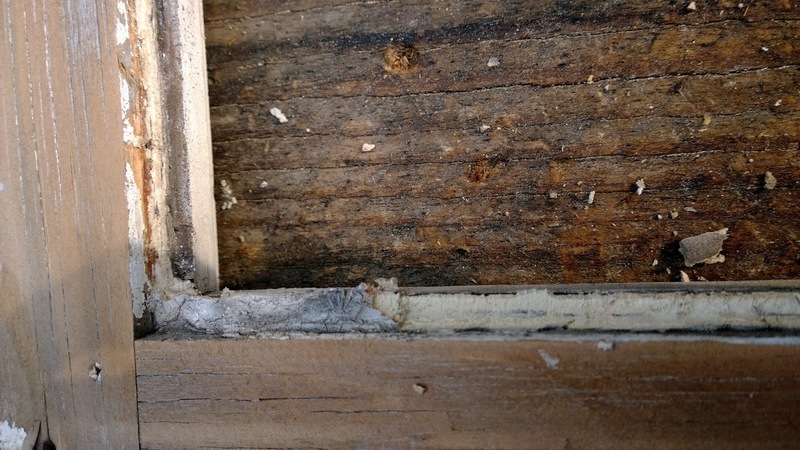 I don't know why I didn't bother to take before pictures, but this is some caulk left in the corner of one of the busted windows. 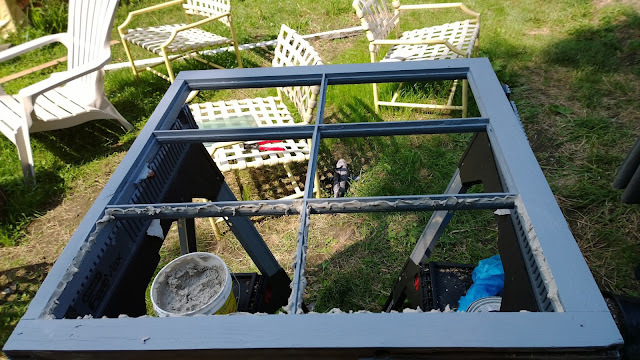 Although I knew not to caulk instead of glaze, I never understood just how bad it was - removing it shredded the wood of the very delicate window, broke the antique glass in a number of windows, took ages, and was just generally awful. Don't do it folks, if it's an emergency fix you're looking for just smooth some glazing in the gap with your finger. Also, don't use finish nails driven all the way through the muntin in the place of the two glazing points you should be using. Just saying . . . 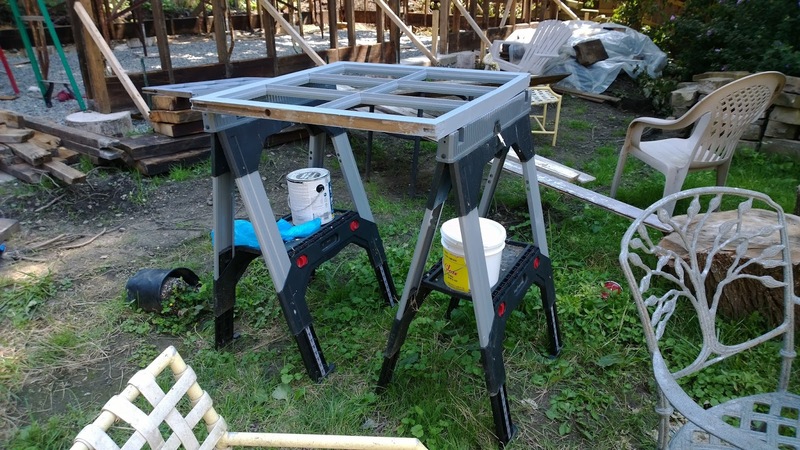 This was my set up for glazing, for glass removal I recommend a regular table as it'll let you put more force into removing the glazing without pushing the sash off the sawhorses. For glazing you want to easily be able to reach underneath the sash to move the glass around, so sawhorses are perfect. And yes, the Sarco dual glaze is an integral part of my set up. Buy some. You need it. The whole sash was sanded, loose joints glued and clamped, and everything but the sides painted with oil based primer. 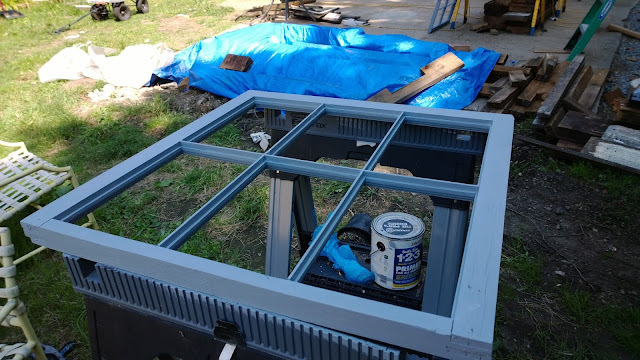 Once the finish coat of paint goes on (after the glazing sets up) I'll wax the sides to protect them and help them slide. Not bad for 138 years old . . .
of putting glass back in a window! Some panes of glass are just suicidal, they will break no matter what you do, so try not to cry (or let them cut you). 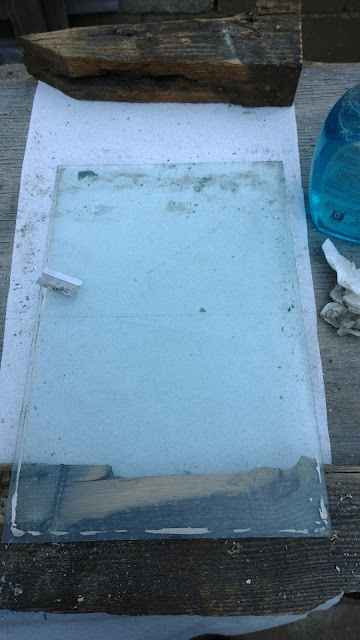 If you have very stubborn glazing, or a very delicate window you may help your mental health by holding the window (with clean glass) up to the light, and evaluating which of the panes you couldn't bear to break (this only applies in the case of antique glass), focus on getting the wavy, distorted pieces out intact, and don't worry to much if the others don't make it. 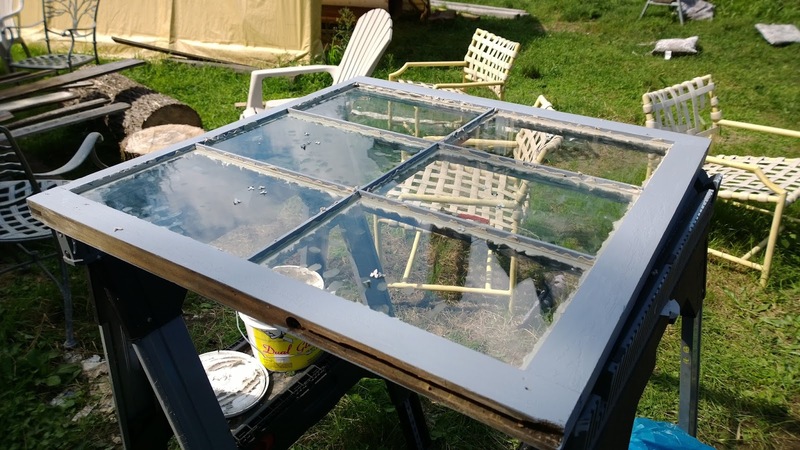 Here in Pittsburgh antique glass is easy and cheap to get, if this isn't the case where you are call window replacement companies (small family run ones are best) that work in historic areas. A nice phone call (do not berate their chosen profession!) and offer of a bit of cash will get you a phone call next time they're ripping out historic windows, after all, they normally have to pay to trash them, they'd rather give them to you as long as you make it easy for them . . . 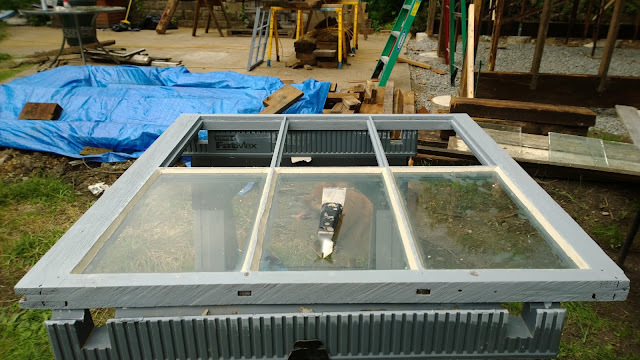 In the windows I've disassembled I've noticed that glass that's been bedded in glazing is generally unbroken, with the wood in better shape in the rabbet. So, that's what I do . . . 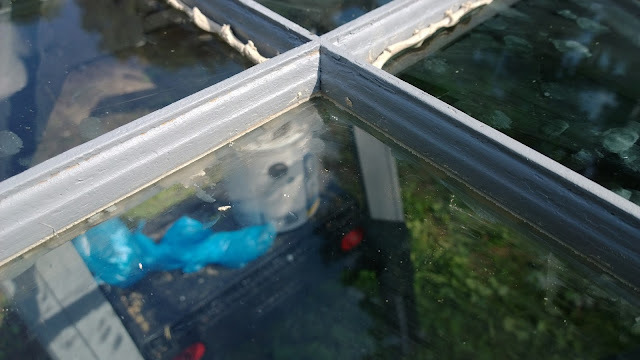 When I install the glazing points I count them out and put them on the panes before installing them as I mysteriously tend to forget them if I don't. 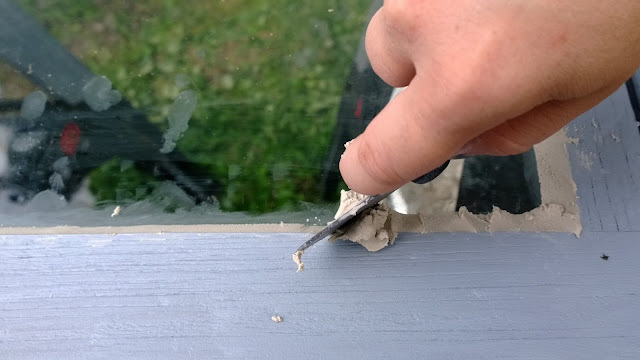 Carefully flip the window over and remove the glazing that's oozed out, I love my teardrop paint scraper for this, just be careful not to gouge the wood - this doesn't require any force. That scraper blade, along with the chisel side of my glazing tool gets the brunt of the initial glazing removal in the break-down stage as well. This is what you'll be left with. Remember, this will face inside, so make sure it's pretty. 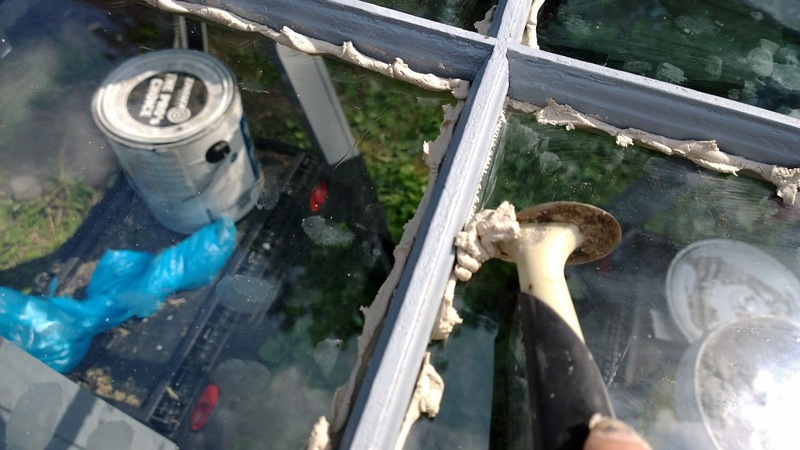 Flip the window over, apply the glaze and use your glazing tool to make the bevel. Pull the tool towards you slowly and at a hard angle, leaving just enough glaze to cover the rabbet visible from underneath to the top of the frame. I start from the middle of each side and pull straight through to the middle of the next side, being careful to keep the angle through the corner. Although glazing is somewhat a point of pride for DIY'ers, I'm the first to admit I'm not that great at it - what's important to remember is to keep a sharp angle, and make sure the putty is bonded and smooth to the wood and the glass. Remember, this is meant to be functional, not an art form! And look, this sash is half done. Why half you ask? Because this was the last of the original glass that could be saved . . . More to come . . .